Alta Price and I have decided not to wait until 2014 as originally announced to reprise our Legacy of Letters Tour and Workshop but to go ahead with one in 2013. We have been spurred to this decision by the urgings of colleagues in Italy and the wonderful time we had in 2012. (See Imprint for just one aspect of the 2012 tour and workshop—the making of the group keepsake. Click here to download the PDF of tour highlights.) We are also excited that many institutions and organizations in Italy will be celebrating Giambattista Bodoni in 2013, the bicentennial of his death, with exhibitions and other events. Legacy of Letters wants to be part of the festivities. 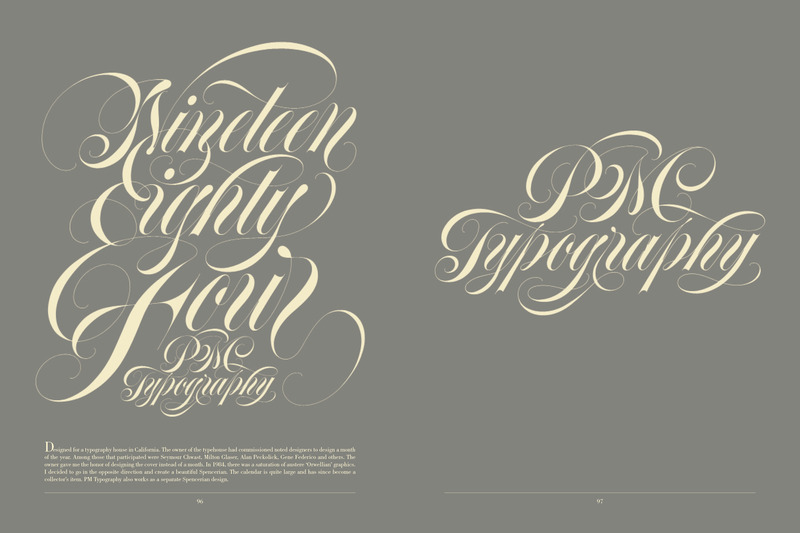 Spencerian lettering by Tony Di Spigna from his forthcoming book Love Letters. The Legacy of Letters Tour and Workshop 2013 will take place from June 23 to July 4, 2013 with another two days after that set aside as a bonus for those wanting to make a pilgrimage to Parma and the Museo Bodoniano. This time the workshops will be led by myself, Tony Di Spigna and Lucio Passerini. As in the past, I will cover the basics of broad pen calligraphy and the history of Western letterforms from Ancient Rome to the Renaissance. Di Spigna, a former partner in Herb Lubalin & Associates, will introduce Spencerian lettering, a subject that he has excelled at for over forty years. And Passerini will, once again, lead the letterpress printing workshop in which participants will produce an individual keepsake and contribute to a group keepsake. 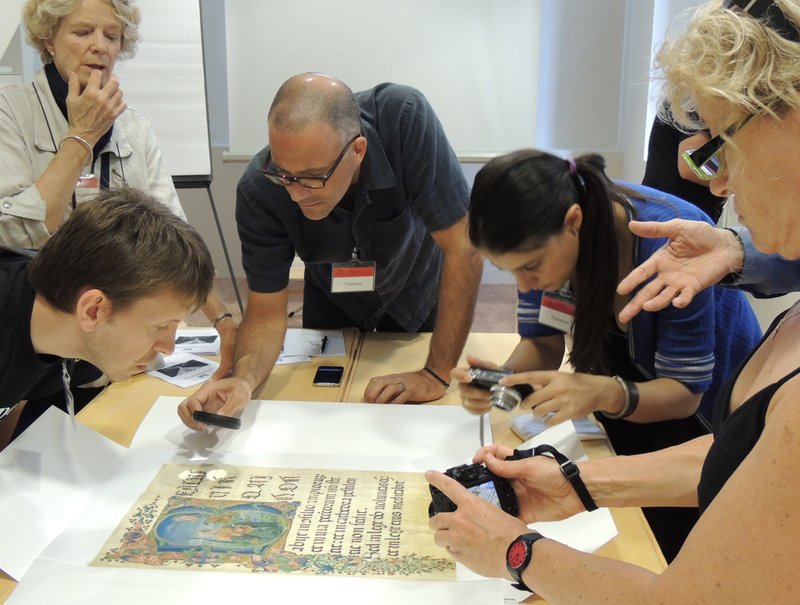 Legacy of Letters participants at the Fondazione Cini examining a medieval “cutting”. Photograph by Patricia Vining. The tour will begin in Venice where we will visit the Fondazione Cini to see examples of medieval calligraphy, early printed books and writing manuals. Then we will spend eight of the remaining nine days at the Tipoteca, a museum of printing history, in Cornuda immersed in the various workshops. On the other day we will travel to Padua to the Biblioteca Seminario del Vescovile to see more manuscripts along with several books printed by Bodoni. While in Padua we will also visit the Museo Archeologico to look at Roman inscriptions and the basilica of S. Antonio to see medieval inscriptions. There will be other activities that will be ﬁnalized in the Spring. Lucio Passerini (right) with Legacy of Letters participants at the Tipoteca. 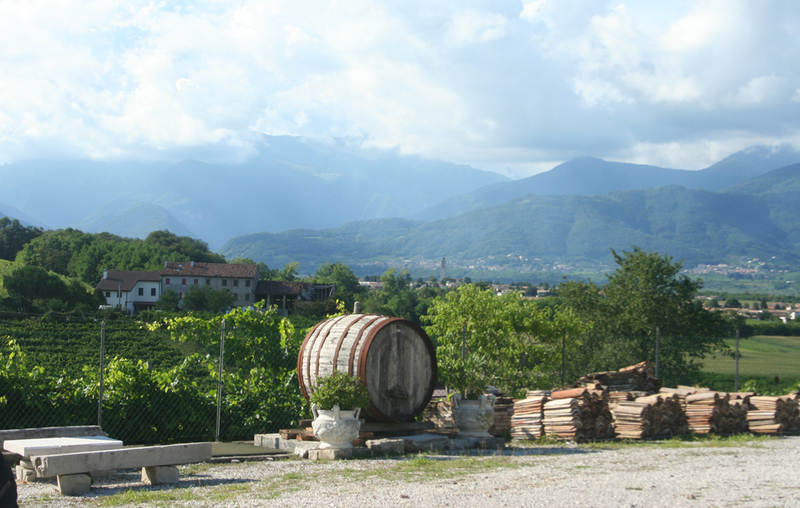 In Cornuda we will again stay at Villa Bolzonello, a working prosecco vineyard. The price of the tour will be $3775 (slightly cheaper than in 2012) with a special discount of $3500 for students and early bird registrants. (The early bird discount is good until March 1, 2013.) We are also offering a day-tripper option for those already in Italy who wish to take the workshops only without staying at the Villa Bolzonello. The Spencerian Lettering Workshop with Tony Di Spigna is $650 (student/early bird price $600); the Letterpress Workshop with Lucio Passerini is $900 (student/early bird price $800); and both workshops are $1400 (student/early bird price $1300). The optional trip to Parma—with a stop in Verona—to visit the Museo Bodoniano will cost $360 (single room occupancy) or $300 (double room occupancy). For those choosing this option as well as the full tour the student/early bird discounted total price will be $3800. The price of the Legacy of Letters 2013 tour/workshop includes all ground transportation within Italy, all lodging, all breakfasts and three special dinners, all entrance fees to museums and other institutions, and all calligraphy and printing supplies. It does not include travel to or from Italy itself, though Alta and I will be glad to assist participants with their travel arrangements. Among the special dinners will be a celebration dinner at a restaurant in the Veneto chosen by Sandro Berra of the Tipoteca who is famous for his excellent knowledge of the region’s cuisine and wine. View north from the back of the Villa Bolzonello in Cornuda. Click here to download the registration fees and cancellation policies. To be added to our mailing list, or ask questions, email paulshaw@nyc.rr.com. Don’t wait as the tour will be restricted to a maximum of 12 people. Ci vediamo in Italia in 2013!